Hi, I'm Snowflake - Reduced Fee!! 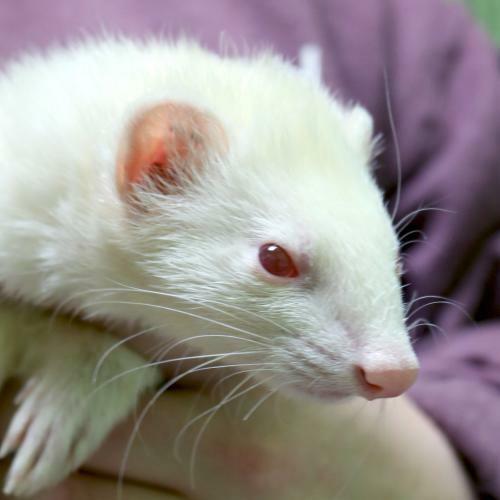 I'm a 1 year old spayed female albino Ferret. I'm a friendly and affectionate girl who likes to be held and petted. My buddy Whiskers and I couldn't bear to be separated, so we must be adopted together. Whiskers is just as wonderful as I am so our adopter will get two times the fun and the love! Ferrets require a large cage and specialized care, so please do your research to see if you can provide us with everything we need to keep us happy and healthy. We also need lots of time outside of our cage every day so we can exercise, play, and interact with our person. We're looking for a responsible and committed adopter who will make us a top priority in their life! Thanks to a generous sponsor our adoption fee is just $50.00! My adoption fee is $25.00 and I must be adopted with Whiskers.